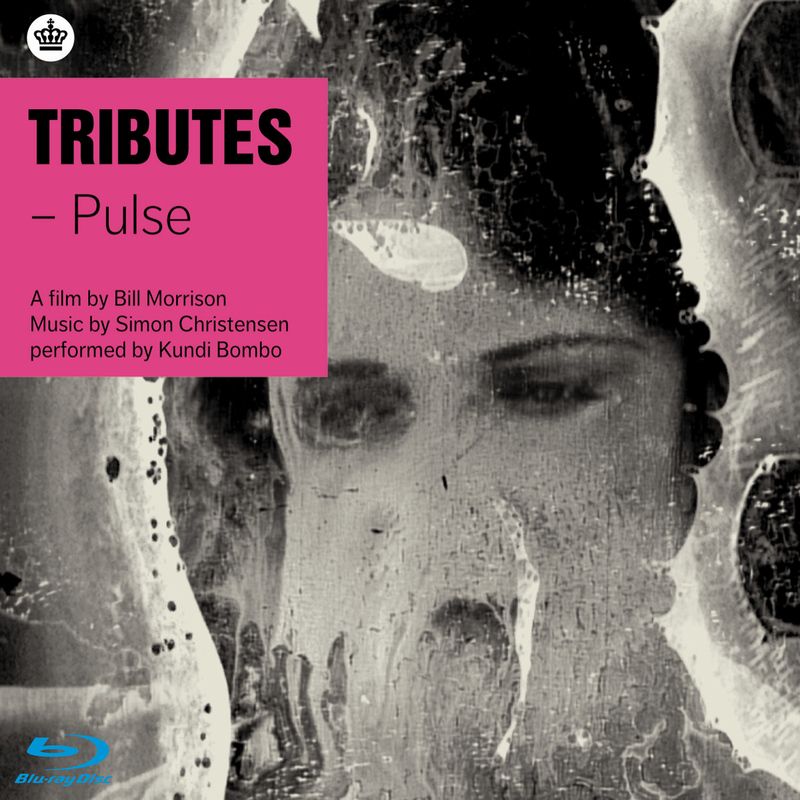 TRIBUTES-Pulse is a collaboration between American filmmaker Bill Morrison (b. 1965) and Danish composer and percussionist Simon Christensen (b. 1971). Christensen originally conceived of the project as a tribute to four American composers, Charles Ives, Conlon Nancarrow, Steve Reich and Trent Reznor. The project is comprised of four movements, with the themes of Shifting (slightest change), Multiple (simultaneously different), Across (different directions) and Beat (moving synchronized) respectively corresponding to each composer. "Tributes - Pulse looks and sounds absolutely terrific...The ability to finally see some of Morrison's work in HD will be more than enough reason to pick up this disc." As much as music, dance, literature, visual art work, or film inevitably reflect their time and place of creation, the most rewarding encounters with artistic creations usually occur when what you are experiencing tells you more about the way the world could be than the way it actually is. The crossing of the line from reality to possibility has been what has propelled most artistic movements forward, and those artistic movements-in kind-have also helped in transforming both our reality and our sense of reality. The American filmmaker Bill Morrison and the Danish composer Simon Christensen have each independently created such transformative work. The result of their first collaboration, TRIBUTES - Pulse, has the clear imprint of them both, and yet their efforts meld together in such a complementary way, a testimony to their both being extremely comfortable about and having a great deal of experience with collaboration. Morrison has most notably worked with composer and Bang on a Can-cofounder Michael Gordon on Decasia (2002) as well as several subsequent projects. He has also forged numerous additional artistic partnerships, including with American nu jazz composer/performers Vijay Iyer, Dave Douglas, and Bill Frisell, Copenhagen-based Icelandic electronic composer and producer Jóhann Jóhannsson, and the New York City-based Ridge Theatre with whom he has developed a revolutionary new approach to the staging of live performances. Similarly, Christensen, active as a laptop artist and percussionist in addition to composing, has created music collectively as part of the indie rock band New Paragraphs, the experimental duo Mobile Soundscapes, and the electronic composer collective Kundi Bombo, who perform the score for TRIBUTES - Pulse. In fact, Christensen's willingness to share authorial control is so second nature to him that it was completely natural for another composer, Morten Riis, to do a remix of Christensen's 2008 string quartet composition Toward Nothingness and for recordings of both the original and the remix to be featured on the same CD, getString (released by Dacapo in 2009). Christensen and Morrison also both employ very tactile approaches to their respective art forms. As a drummer, Christensen is always aware of music's physicality despite its abstraction. Morrison began his career as a painter and his sensibility as a film maker clearly reflects that. But perhaps even more significantly, Morrison and Christensen both create work in which elements of the past and the future symbiotically co-exist; elements of the past are mined through modern-day technology to shape the future. Just as Christensen manipulates sound via laptops and combines such new electronic instruments with musical instruments that have been around for centuries, Morrison works extensively with deteriorating film footage from the dawn of motion pictures, creating eerily surreal montages of a time that never was. Christensen's first exposure to Morrison's work was How To Pray (2006), which featured music by David Lang, another Bang on a Can co-founder. Christensen later performed Lang's score, in a modified instrumentation, with Kundi Bombo. Soon after that, he saw snippets of some of Morrison's other works online and was intrigued enough to contact him in 2008 about a possible collaboration. Morrison was already familiar with Christensen's music and was open to the idea although the project to create a large scale piece in four parts did not get underway until 2010. But already back in 2007, Christensen was considering creating a four part musical composition. His friend, saxophonist and composer Peter Navarro--Alonso, had put the idea in his head to write a piece in which the saxophonist would play four different saxophones-soprano, alto, tenor, and baritone. In the ensemble for the eventual score for TRIBUTES - Pulse, the saxophonist is joined by violin, zither (which Christensen only began playing in 2009), percussion, and laptop. After seeing a performance of Ives's 4th Symphony, I changed my way of thinking music and dealing with rhythms. The distribution of the different bands in the hall and the very different music they play knocked me out. Since then I have almost always been using click tracks in my work in order to achieve multiple different pulses, and also taking the spatialisation of the -music/musicians/loudspeakers into consideration. When I first heard Nancarrow I realized that extremely complex rhythms are possible on a "machine" and it trigged me into working with electronics and computers. I have over the years changed my attitude towards electronics; I prefer humans to play the complex stuff and use the electronics merely for "sound" and the laptop to control the overall time or the "synchronization" of tempos. Steve Reich's earlier works made me realize that complex music can be created with very simple material and here I heard the connection between my past as a rock/jazz drummer and my work as a composer. There's something magical about shifting and the idea of letting the music shift the slightest. And Trent Reznor represents constant beat/rhythm. The constant beat is always in front of my mind when I compose; in all my music I try to find a delicate balance of complex constantly changing rhythms and stable and "easily" perceptible beats. Christensen has described the four sections of TRIBUTES - Pulse as Shifting (slightest change), Multiple (simultaneously different), Across (different directions), and Beat (moving synchronized). Simon's inspiration to use four American composers that spanned the 20th century informed the direction that I wanted the imagery to follow. As Simon was inspired by American-born composers that spanned the Industrial Age, I was looking for iconic shots of the Frontier, Industry, and Flight, that would dovetail with imagery of the life cycle of a human, and would be told using the uniquely 20th century medium of film. So I was attracted to the stampeding buffalo imagery, oil wells, aviators as well as the clips of a baby crying, a young girl, a young woman, a romance, adulthood, old age, as seen through an ephemeral and antiquated medium. As with Decasia, I was interested in using decomposing nitrate film again, and there is a vault manager at the Library of Congress who let me check out what they have that was being thrown out. I also worked with a lab (Colorlab) that developed a method for transferring this material at high resolution. Just as the four sections of the music are clearly delineated, so are the four sections of the film, which correspond to the four elements according to classical antiquity: Water, Earth, Fire, and Air. Specifically, in the first section we see glimpses of a woman's life. In the second, buffalo roam across a plain. The third section is about industry, and the final section explores aerial flight. In the final section, Morrison also includes footage from the present day, although fits right in with his recontextualizations of deteriorated film footage-he filmed live action aerial footage (from on board a helicopter) of decaying ships off of Staten Island, NY. But curiously, though Christensen and Morrison were both inspired by music and images going back over a century, the methods they used to work together are very much unique to our own time: email, demos uploaded online, etc. With TRIBUTES - Pulse, Morrison and Christensen have created a work that is at the same time a "requiem for the 20th century," a moniker they have used to describe the piece, as well as a new kind of art work for the 21st century. The way they have balanced the dichotomy between tradition and innovation-the past and the future-offers extremely engaging and provocative possibilities for the present. Booking og leje verden over, kontakt www.edition-s.dk.